This dog carries two copies of h and will not have a harlequin coat color. The dog will pass on h to 100% of its offspring. This dog carries one copy of H and one copy of h which results in a harlequin coat color. However, this dog’s coat color is also dependent on the M gene. The harlequin coat color is only expressed if the dog is also M/M or M/m at the M (merle) coat color locus which causes the dilute regions of the merle pattern to become white. This dog will pass on H to 50% of its offspring and h to 50% of its offspring. This dog carries two copies of H which is not compatible with life. Dogs with two copies of H die In Utero. Harlequin is a specific coat color pattern marked by patches of full color on a white background. This patterning is a result of the interaction of two different genes, the merle (M Locus) gene, PMEL, and a modifier gene, PSMB7, at the harlequin (H locus). Dogs that have one copy of H in addition to one copy of M will have the characteristic harlequin coat color pattern. A dog with one copy of H but two copies of M (double merle) has a coat color that can be indistinguishable from a dog without the harlequin variant. While the harlequin coat color is not considered a defect, breeding studies indicate that inheriting two copies of the H gene variant is not compatible with life. Puppies with two copies of the PSMB7 gene variant (H/H) most likely die very early in gestation; therefore, breeding two dogs with harlequin coat color (H/h) may result in reduced litter size. Genetic testing of the PSMB7 gene will reliably determine whether a dog is a genetic Carrier of the harlequin coat color. Harlequin coat color is inherited in an Autosomal Dominant manner in dogs meaning that dogs only need to inherit one copy of the variant gene to have the characteristic harlequin coat color. 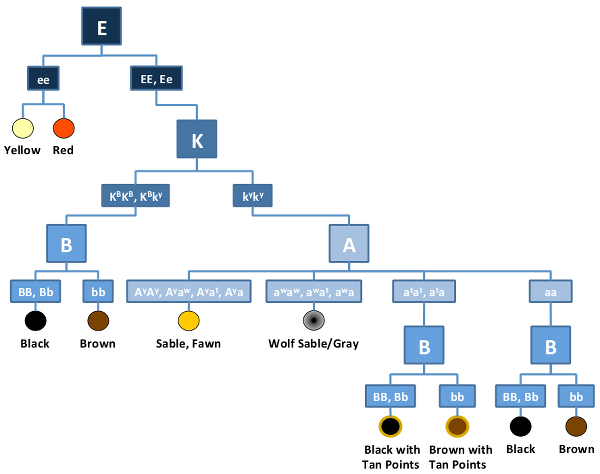 Each pup that is born to a dog with the harlequin coat color has a 50% chance of inheriting one copy of the PSMB7 gene variant (H) and having a harlequin coat color. Breeding of two dogs with harlequin coat color is not recommended as this condition appears to be lethal in offspring that inherit two copies of the variant. These types of breedings may generate small litters or no offspring. Mantle colored dogs with either one copy or no copies of the harlequin gene are physically indistinguishable from each other. This genetic test will allow for identification of mantle colored dogs with one copy of the harlequin gene to prevent breeding them to another dog carrying a harlequin gene and thus, decreasing chances of embryological death of puppies. Reliable genetic testing is important for determining breeding practices. In order to avoid producing Homozygous pups, breeding of known carriers to each other is not recommended.